To get truly inspired, it’s best to read the Guide from start to finish. 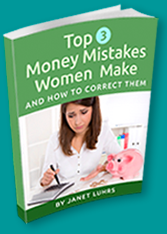 Every chapter includes lessons, loads of inspiration and profiles of real people who have simplified their lives – all ages, all income levels and all types. But no worries if you’re too busy – The Simple Living Guide is divided into stand-alone chapters. You can begin anywhere you want! Money. Got money problems or yearning for financial independence? Read the “Money” chapter. Clutter and home. If clutter and a crazy home life has you feeling overwhelmed, read the “Home” chapter. Health and happiness. Looking for natural ways to be healthier and happier? Read the “Health” chapter. Family life. Yes, you can raise your kids simply. Read the “Families” chapter. Housing. 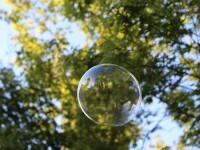 Looking for creative ways to live well for much less? Read the “Housing” chapter. Inspiration. Every chapter includes loads of real life profiles of people who have simplified from all walks of life. Time. 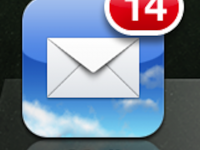 Feel like you’re buried in commitments and want your time back? Read the “Time” chapter. Love, work and peace. How about making your relationship sing, or your workplace happier, or what about finding peace within yourself? There’s a chapter for each one of those topics and lots more. 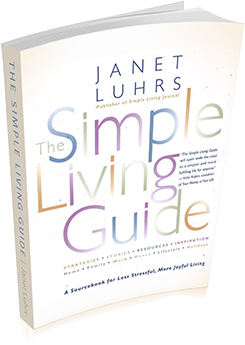 The Simple Living Guide is one of those rare books that people read over and over again, and you will, too. I wrote Simple Loving because I was blown away by the incredibly rich, close, intimate relationships I witnessed when talking to couples who had simplified their lives. They inspired me so much that I decided to research why this was so. Simple Loving lays out the common themes, and offers an inspirational collection of intimate profiles, detailed tips, and resources for nurturing your most precious relationships–not just with your partner but with children and other family members as well. A big theme I discovered when meeting these couples is that they live what I call “the examined life” – meaning, they consciously create the lives they want – and then, they consciously create the relationships they want. They know who they are and what they want every step of the way – and they prioritize their dreams. It’s a fabulous, heart-warming thing to see, believe me. You’ll feel the same way after reading Simple Loving – and better yet – you’ll know how to create deep, satisfying, intimate relationships in your own life, too. This wise and wonderful book came to me exactly when I needed it. I’ve only had it for a few days, but it’s already helped open the lines of communication between my husband and myself. Like her previous book (“Simple Living”) this book follows the same formula of using real life couples to illustrate the points in each chapter. They provide real life role-models for a deeper, more intimate relationship. 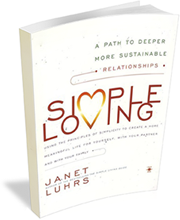 Being rooted in the simplicity movement, this book may not be for every couple. Luhrs believes that love is about more than your mate’s appearance or the car they drive. But at the same time, you don’t have to be a back-to-the-lander to appreciate her eloquent message of deep love and commitment. *These reviews were originally posted on amazon.com. This is truly a handbook for life! Super tips...especially the money section! Do you have any idea how much your book changed our lives? Following your guidance about home ownership we didn't buy anything big or what we'd 'qualify' to buy. We paid it off in 15 years and are only on our second cars in 22 years of togetherness.